A karst landscape is an underground freak show (pictured) formed from the dissolution of soluble rocks including limestone, dolomite and gypsum. The word, itself, is the German name of Kras, an area in Italy and Slovenia, where it is called Carso and where the phenomenon was first studied. Karst areas are characterized by drainage holes on the surface, underground caves and drainage systems and collapses triggered by the development of underlying caves. 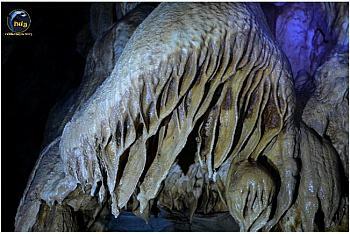 In popular perception, the best known features of karst areas are stalactites and stalagmites. The thing on the right is neither-nor—it's a "flowstone"; technically, all such delicacies are called speliothems. There are in southern Italy a number of fetching death-traps... caves...that will appeal to you if you are attracted by the depths of the earth (like our friend in the photo on the right. Are you kidding me?! I know him, and he has not surfaced yet, though we do get an occasional e-mail.) 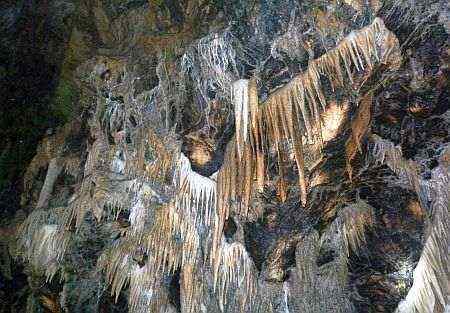 The discipline of studying these areas—not just karst caves, but any kind of cave—is called speleology. 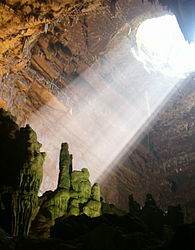 The sport of climbing around in them is called "caving" or "spelunking." taken quite near the lake shown on the left. First, in the Campania region of Italy (of which Naples is the capital), there are two primary karst regions: The Matese and the Cilento, both characterized by extensive karst formations in caves, some of which have been made safe even for casual tourists and are what we call “show caves”—guides take you in and lead you around. The Matese massif is about 70 km (45 miles) northeast of Naples. 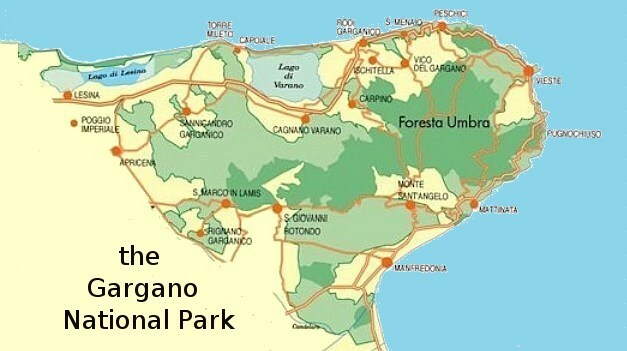 It contains the Matese Regional Park, one of the protected natural areas in Campania; the park has been in existence since 2002. 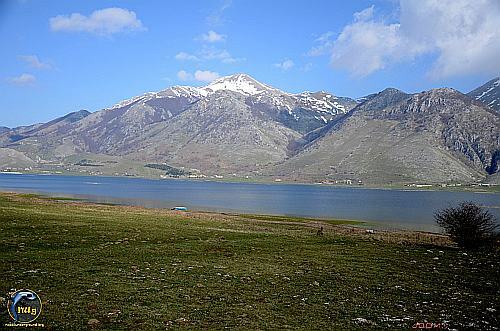 Lake Matese (image, left) is the highest karst lake in Italy and is at the foot of Mt. Miletto (2050 m/6200 feet) and Mt. Gallinola (1923 m/6000 feet). (A karst lake is usually at higher altitudes and is fed by snow and rain run-off from surrounding mountains and by an extensive flow of undergound water.) The Matese Regional Park has an area of about 330 sq.km/130 sq.miles), at the heart of which is not only the lake but the very scenic surrounding valley. Beneath the lake is a vast underground waterworld of ponds and streams typical of many karst areas. The area is relatively little-known or, at least, little frequented but gaining “speleo-credibility” with time and good press. The Cilento area south of Salerno contains the Alburni massif; it is is a relatively small part of the entire Cilento and Vallo di Diano National Park in the province of Salerno. The massif (or table land, or plateau) rises like a rectangular loaf of bread 10 km wide by 21 km long. The long axis runs SE to NW; the NW flank is a wall of dolomite peaks of up to 1800 meters in elevation and faces across the plain of Paestum to the city of Salerno, 40 km distant. (The sedimentary carbonate rock, dolomite, of course, has given its name to the entire and very spectacular mountain range in northern Italy and to similar smaller formations that then term themselves the This-Dolomites or That-Dolomites. The Alburni massif may be referred to, for example, as the Campanian Dolomites.) The loaf/massif slopes slightly down as it runs back to the SE and then drops off suddenly onto the plain of the Vallo di Diano. The massif sits atop two prominent show caves, the Castelcivita grotto (with the delightful fellow seen in the image, right) and the Pertosa Caves, both of which host casual tourism as well as more intense visits. The region bordering on Campania dirctly to the south along the coast is Basilicata, the older term for which is Lucania, the home of a pre-Greek and pre-Roman Italic people. The regional registry that keeps tabs on the geological wonders of karst caves in that area currenty shows over 200 of them, about half of which are near Maratea with the others widely spread around. About half of those near Maratea are marine karst caves; that is, the entrances are on the coast. The entrances may be above sea level but very often are submerged or partially submerged by seawater. It is potentially dangerous sport diving. The deepest karst cava in Basilicata is the Grotto of Castel di Lepre near Marsico Nuovo at 146 meters (from the entrance to the bottom). The most extensive network of caves is the Grotto of the Dragon of Maratea, in which there are two kilometers of galleries and tunnels to get lost in. If you really want to go into that one, you have to arrange ahead and go with an expert. Some of the others, such as the Grotto of Wonders at the marina of Maratea give less strenuous, regular tours. As far as I can determine, Sicily has many karst areas, but in terms of organized tourism it is as yet underdeveloped. 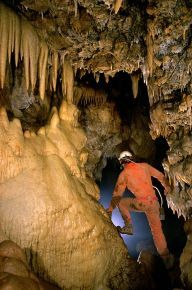 The Regional Speleological Federation of Sicily was not founded until 1991; its immediate objectives have been to catalog and preserve what they have. Of course, in Sicily, you are not restricted to karst caves. Speleo- just means 'cave'. You can always try the famous lava tubes (or tunnels) of Sicily. A lava tube is a long hollow below the surface of a solidified lava flow, created when lava that was still molten continued to flow after the surface had become solid. The slopes of the ever-erupting Mt. Etna have a lot of those. Or you can try The Ear of Dionysius (the reference is to Dionysius I, tyrant of Syracuse in 400 BC, a ruler so vicious that in Dante's Inferno, he suffers forever in a river of boiling blood!) 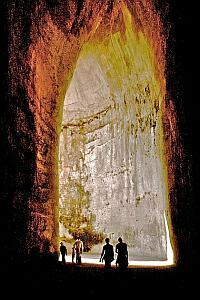 It is a limestone cave in the Temenites hill in the city of Syracuse. Its name comes from its supposed similarity in shape to the human ear. At least that's what it looked like to the painter, Caravaggio. The name stuck. It is 23 meters high and extends 65 meters back into the cliff. Horizontally, it bends in an approximate "S" shape; vertically it is tapered at the top like a teardrop. It is famous for good acoustics. Originally, the cave was most likely a quarry dug in Greek and Roman times and then converted into a cistern to provide water for the city of Syracuse. Salento is the name of a geographic area (not an official administrative region or province - more on historical names here) at the southern end of the region of Apulia (Puglia - darkened area on map, right) in Southern Italy. 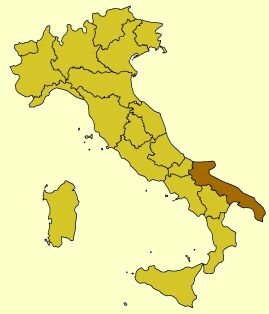 It is a sub-peninsula of the Italian peninsula, itself, and is often described as the "heel" of the "boot" (with a length of about 135 km/85 miles). The area extends into three provinces of Puglia: Lecce, Brindisi amd Taranto. The west coast is on the Ionian Sea; the entire east coast (down to the bottomost point of the heel) is, by convention, still the Adriatic. The east coast, from Otranto down to Santa Maria di Leuca (the bottom-most tip of Salento) is limestone and is marked by significant coastal caves, all of which are interesting and some of which contain prehistoric cave graffiti. The most notable ones start near the town of Castro, 15 km south of Otranto, and extend down the coast. Some of them are organized "show caves" (guides take you in, guides bring you out), others are less so and you may explore them on your own. Grotta del Drago (of the dragon), with a 30-40-meter-wide entrance and a water depth of about 50. Noted for a rock formation that resembles the head of a dragon. There are at least a dozen named grottoes, some of which are "show caves" and all of which have something to offer: the Grotta Sfondata (collapsed), the Campana (bell), the Grotta dei Contrabbandieri (smugglers), the Grotta dei Due Occhi (two eyes), the Grotta dei Colombi (doves), the Grotta dei Pipistrelli (bats) and many others. There's an emerald grotta, a sirens' grotto, a grotto of dreams, of pharaohs, serpents and marble. At the height of summer this part of the coast is frequented, but not as much as you might imagine. The Gargano is still pretty much neglected. The non-caver tourists who frequent these grottoes tend to do so in tour boats; on the other hand you might want to avoid that in favor of something a bit more personal. Try a kayak.